The “Need More” campaign is a group initiative across UK fire services focusing on attracting more people to join their on call fire fighter crews. On call firefighters are trained with the skills to join full time firefighters in emergency situations, with their fire duties fitting around their work and family lives. Derbyshire Fire were looking for a way to push the campaign and get the message out there, so they turned to Fleet ID for full livery for three Derbyshire Fire and Rescue Pumps to be sent to fire stations throughout Derbyshire as part of the drive to raise awareness. With a deadline looming, we got to work straight away, helping to make the artwork files from the Derbyshire Fire and Rescue design team print ready and booking in a fitting date. With so many metres of media to print, the machines needed to be rolling quickly! The Fleet ID fitters arrived on site at the Ripley Training Centre and the first thing to do was to remove any existing livery and make the vehicle surface ready for applying the graphics. When this was done it was all systems go! All vehicles were fully wrapped within 6 days and ready to hit the road. Find out more about the campaign in this video – you’ll see Fleet ID’s handy work around the middle of the clip! Fleet ID understands the importance of the ‘Need More’ campaign to the fire service and the huge difference that more recruits would make in helping communities stay safe. It was a pleasure to work with Derbyshire fire on this vital initiative and we look forward to helping more fire services from around the UK with similar efforts. If you would like to talk to Fleet ID about a similar project or anything that we may be able to help with (we also supply full Battenberg and chevron markings) please call today on 0344 2098775. The Emergency Services Show 2018 – Our Best Show to Date! What a show that was! It has been pretty busy back at Fleet ID HQ since The Emergency Services Show last week and we just wanted to thank all visitors to our stand for their time. It was great to see so many industry experts, put some names to faces and catch up with some old friends too. It’s safe to say that EES 2018 has been our most successful exhibition to date, giving us the platform to showcase our services to Police, Fire, Ambulance and other Emergency Service sectors. Visitors to our stand were able to see how our services would best benefit them – whether it be conspicuity markings for their bespoke build vehicles or using our fully qualified fitters who are based all around the country. We know how important it is for our Emergency Service customers to have reflective markings for their entire fleet, from older vehicles to brand new. Our templating service ensures that we are able to obtain vehicle data for any vehicle, if we should have an enquiry for conspicuity markings for a vehicle that we don’t currently hold. The main attractions on our stand were undoubtedly the Renault Koleos (as seen above) and Kawasaki motorbike which both had eye-catching Avery V-8000 markings applied. The other material manufacturers we use were also featured – 3M, Nikkalite, Avery and Orafol – showing that we have a material to suit any application and for any vehicle from motorbikes to full box back vehicles. Once again, a big thank you if you came to see us at the show – we look forward to speaking to you again soon to see how we can help with your livery requirements. If you didn’t make it along to our stand on the day, no worries. Just call today on 0344 2098775 to discuss your requirements – we’re here ready to keep your fleet covered! Click below to find out more about the materials we use. 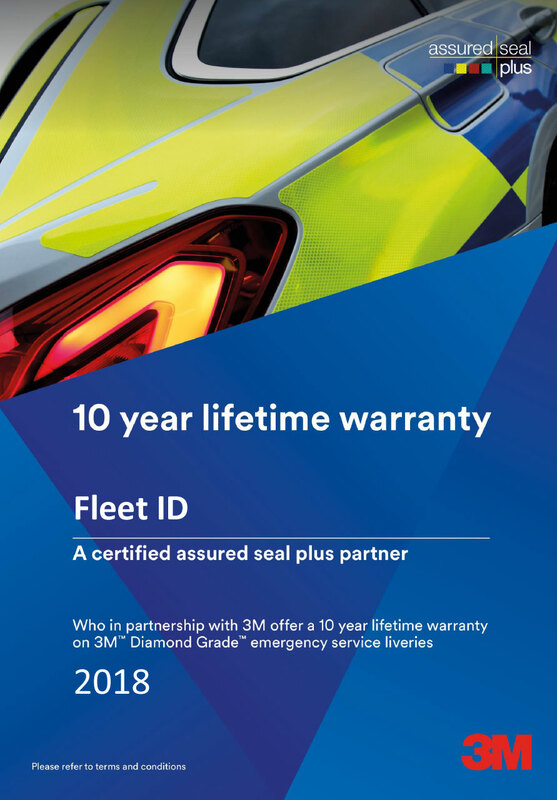 After much hard work and the continued, valued support from the various fleet communities that we are involved with, we are delighted to announce that we are now a 3M certified assured seal plus partner. This means that we can pass on all of the benefits that go along with this to our customers and partners – something which we are over the moon about. We feel that this fantastic accolade, along with the 3M Fitter Training Programme we are affiliated with, now enables us to provide a complete package and peace of mind to our customers across the board – from fleet managers to fitters and converters. If you feel we can help you with any fleet marking requirements, whether it is Chapter 8 chevron kits, emergency service markings or full fleet livery, please give us a call on 0344 2098775 or email us on sales@fleetid.co.uk. As part of our dedication to providing Chapter 8 and emergency service conspicuity markings in the best products available in the marketplace, we are expanding our portfolio of reflective materials. We are pleased to announce that we are adding Avery V-8000 – a Superior Prismatic Reflective film for fleet vehicles. Avery Dennison VisiFlex V-8000 Series is available in white, blue, green, red, fluorescent yellow green and fluorescent orange. It provides long term durability (7 years for standard colours and 5 years for fluorescents). No edge sealing is required, which saves time and money during conversion and application. Easy to apply and its flexibility allows to fit over complex construction of new vehicle body shapes. As well as a striking daytime appearance, Avery Dennison VisiFlex V-8000 has a bright night-time presence which is perfect for all fleet conspicuity requirements. If you have any questions regarding this fantastic reflective product, or anything else Chapter 8 or emergency service fleet livery related, please just call on 0344 2098775 to speak to the Fleet ID team or by email at sales@fleetid.co.uk. Fitting reflective markings to vehicles can seem a daunting task and it has to be said, there is plenty of skill involved to do it right. Experience goes a long way too and these are things that are on offer on the 3M Emergency Service Vehicle Fitter Training Course. The course is open to anyone who is interested in learning how to apply reflective vehicle graphics successfully, from total beginner to those already using the 3M product range. The course outlines how retro reflective materials work and are constructed, how to make it stick properly and how to correctly apply it to Emergency Service vehicles. Learners will gain hands on application experience under the supervision of an expert trainer and increase their in depth knowledge of the materials and best practise fitting techniques. As a 3M converter, we are able to put people forward who are interested in attending the course – we have various partners attending the course during November. If you are interested in attending with a view to becoming a Fleet ID and 3M approved fitter please do not hesitate in contacting us on 0344 2098775 or by email on sales@fleetid.co.uk. It has been some weeks now since we exhibited at The Emergency Services Show at the NEC and things have been pretty hectic back at the office! Once again, the show was a great success for us – it’s great to have the opportunity to put some faces to names and meet so many new faces too. The Emergency Services Show is the perfect place for us to showcase the quality Emergency Service products that we sell and to talk about the new developments at Fleet ID. Of particular interest, from the feedback we got at the show, was how proactive we are in gaining new vehicle templates, ensuring that we have conspicuity kits and livery templates that our customers need and constantly adding to our ever-growing directory of template vehicles. As soon as a new vehicle is released, we’re on the case to get the template as soon as possible. We know how important it is to our Emergency Service customers to have reflective markings for their entire fleet, from older vehicles to brand new. It was incredible to see so many examples of our work in and around the show – 8 Emergency Service vehicles in total, all produced in 3M Diamond Grade. 3M Diamond Grade is just one of the high quality reflective materials we work with – we deal with all major manufacturers of reflective and fluorescent materials, giving our customers the freedom to choose which one is right for them. Our nationwide fitting service was also a good talking point. No matter where you are, our experienced fitting team can reach you, fitting your fleet markings at your location wherever possible and ensuring that you are fully road ready before leaving site. This way, you’re safe in the knowledge that your conspicuity markings and Chapter 8 livery is up to the job, keeping your fleet and other road users safe as you get on with the most important job of all. We’ve noticed that preparations are already under way for next year’s Emergency Services Show – click here to visit the website where you can see photos of the 2017 exhibition. In the meantime, if you would like to discuss any livery and reflective marking requirements for your fleet please do not hesitate to get in touch on 0344 2098775 or by email on sales@fleetid.co.uk.